For many of us, chocolate can be our kryptonite. Try as we might, sometimes we just can't resist the call! Here are some of Black Rhino's favorite candy bars! 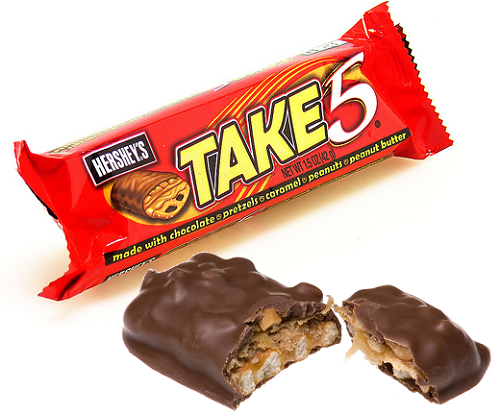 Take 5 : I have been known to gravitate towards salty snacks more so than sweet, but I simply can’t resist the Take 5 bar, which offers a perfect ratio of both. It’s five layers of pretzels, peanuts, peanut butter and caramel all wrapped in milk chocolate. I know it sounds like a lot, but give it a try- you won’t be disappointed. My favorite candy bar is the 100 Grand Bar. It’s got everything. Crunchy bits. Chewy caramel. Smooth chocolate. Snickers runs a close second for similar reasons. Skor. Remember this one? Thin, brittle toffee, dipped in milk chocolate. I’d love it if there was a dark chocolate version! A girl can dream. HOWEVER, if this was a “desert island” candy bar, it’d be Twix. Frozen. Do they have freezers on desert islands…? My favorite candy bar is also the KitKat. It's tried and true, simple and sweet. Name another candy that does chocolate and wafer like KitKat does. Gimme a break! What are some of your favorite candy bars? Which ones did we miss? Let us know in the comments! This week, we went through the AFI Top 100 List to see what movies we had seen along with which movie stuck out to us the most. While there are several on this list I could fully recommend and have immensely enjoyed, the one that springs to mind the most of #9: Vertigo. This also happens to be my all time favorite Alfred Hitchcock movie (yes, I’ve seen if not all, most of his films). Given that it’s a Hitchcock film there it certainly has the prerequisite of suspense and thrilling scenes. 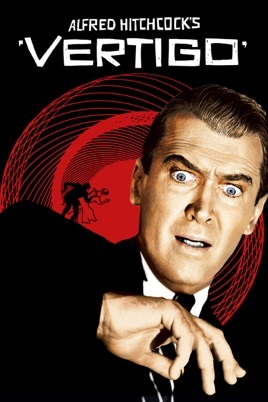 My favorite aspect however is the twist – I won’t give it away if you haven’t seen it- but this is another example of a great film that keeps you hooked from the beginning and doesn’t disappoint. 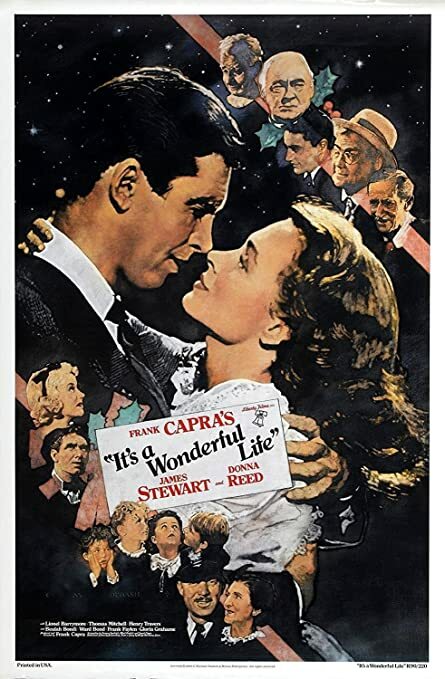 My favorite movie is It's a Wonderful Life. I have watched this film in its entirety at least 30 times. Probably more. It has been a Christmas tradition since my childhood and has continued ever since. I love this movie. I can rattle off most of the dialog and lines from this script are sprinkled in conversations with my family throughout the year. Good movie, good memories. The one movie that left the strongest impression on me when I saw it was 12 Angry Men. Shot in B&W, set entirely in a jury room with only 12 men, it was a brilliant demonstration of what happens when people are challenged to verbalize their thoughts and conflicting points of view; the impact of prejudice (hidden or open), close proximity, and emotional fatigue; and the influence people can have on each other, especially a calm and intelligent leader. I remember being shocked that the jury was all male. Just 3 years after my birth. My favorite movie on this list is Gone with the Wind because I love the characters, the setting, and the story. I have loved this movie since I was a child. I also really like Scarlet because she was strong (except for the times when she was around that boring guy she was in love with). 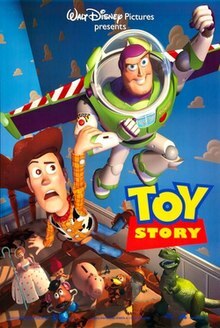 As a millennial, the movie that excited me the most was Toy Story. It's got everything I love: comedy, good story, and nostalgia! I still have my work cut out for me it seems. How many movies on the list have you seen? Let us know in the comments! If you have a long commute to and from work like us, you could probably use a good podcast to listen to. Here's a few of our favorites! Great podcast for learning a little more about everything. Entertaining and fun, the hosts, Josh and Chuck are relatable and funny, and the content of every podcast is well researched and explained. They cover various topics including: Crime, Space, Sociology, Music, Neuroscience, History, Art and more. Give it a listen. You won’t be disappointed. It drills in on the one thing that separates great companies from good ones, innovation. This blog helps business leaders think about things differently in all areas of their business. I love the breadth of information, insight and inspiration I get from these brief but powerful podcasts. Jeff - Wisecrack - Show Me the Meaning! If you're a movie buff like me, you'll enjoy this podcast that dives into the deeper meaning and cultural significance of the most, and least, iconic movies of our age. One of Wisecrack's several podcasts, Show Me The Meaning! breaks down the good, the bad, and the ugly, loaded with trivia, philosophical insight, and thought provoking takeaways. BBC Persia – Because I like to keep myself updated about what is going on in my country and in the world, even if BBC is really good at manipulate the facts! In Aaron Mahnke's popular podcast show Lore he tackles the spooky stories, ghostly hauntings, and frightening histories of our past. It takes a look at history and delves into the creepy folklore and stories that have been passed down through generations; the way Mahnke tells these stories mixed with the music in the background enhances the level of creepiness. Despite all the spookiness, you still learn genuinely interesting information. Episode 89, Fanning the Flames, is especially creepy because is revolves around Chicago and different tales that take place in the city. That last one is so scary. Do you know how hard it is to face the empty page? The one that’s waiting for those brilliant words. Or the unexpected image? Let alone the concept…the IDEA. Where is it? When will it emerge? What I can tell you from personal experience is that sitting in front of that blank page (ok screen maybe), staring at it, is one of the best ways for it NOT to happen. In fact the best way to freeze your mind. That’s pretty hard to do with images though—you can’t just “put a few images on paper”. You have to look around, walk around, listen, absorb, notice, observe everything around you…all the time. TV, movies, theatre, dance, art, music, sports, nature, animals, people, magazines, books, machines…the places from which inspiration arise are endless. That’s why you hear about those companies with crazy fun areas for creatives to “play”. Because sometimes the best way to unlock is by exposing it to something completely different. Literally distract it! Get those other brain waves going. It’s why lots of ideas happen when you’re driving or cycling or running or whatever: the left brain is involved, which leaves the right brain (the free-thinking “creative” side) free to produce, to create connections and release what’s in there. Magic! Hence, the creative’s mind is pretty much never at rest. Always trying to come up with the idea, the nugget that will prompt a few words or some graphics, or some graphic way of presenting words. Some wonderful marriage of words and graphics. You never know when it will come. Or even if. Take this article. I fussed and fumed about what to write in my next blog. I mean, what’s with that?! After nearly 40 years of being a “creative”, I couldn’t think of a topic?? Good grief that’s pitiful. But actually such a perfect example of what it’s like. I have been studying the Korean language, culture, and economy for some time, and have been interested in understanding their consumerism and buying habits and how that may differ from the United States. The mixture of collectivism and increase of wealth in Asia have influenced the South Korean market greatly and promoted a mass influx of luxury buying in the country. South Korea is a homogeneous country with a very heavy focus on collectivism. They prefer interdependence over independence and follow group patterns. Consumer-wise, they prefer to follow the same trends and buy the same things. They don’t like to stick out from the crowd or differentiate themselves from others too drastically. For example, Hyundai Motor Company reported that nearly 90% of cars purchased by Koreans are white, gray, or black. Of those, most are Hyundai and Kia cars. Similarly, there was a trend in South Korea in which everybody wore a long black winter coat. Almost every single person on the street had the same coat on. Well, almost the same. The only difference was the brand of the coat. While, in the United States, brand logos are on the front of the jacket, so you can see it when you look into a mirror, in South Korea brand logos are on the back of jackets so other people can see what brand you are wearing. They want to display a prestigious brand to tell people that they can afford a luxury coat just like the next person. This is both a way to compete with their neighbors and show a bit of uniqueness without having the risk of standing out too much. The increase of desire for luxury products can be attributed to the steady rise of the country’s wealth as well as the increase of global influence on South Korea. Displaying a brand that is both luxurious and globally recognized is the pinnacle of so western brands have been making a huge impact in Korea. Only 5% of Koreans feel guilty about buying luxury goods - compared to 15% in other developed countries - and only 22% think it is in poor taste to show - compared to 45% of Japanese people. Department stores are the main place where consumers are making their purchases. Lotte and Shinsegae are just a couple of the huge shopping centers where over 70% of customers are buying their luxury goods. For those who cannot afford the higher prices of these centers, about 10% of consumers frequent the luxury outlets that the larger department stores have created, or simply find a local street vendor who offer mock luxury items. The South Korean consumer market is substantial, and with over 25 million people living in the Seoul-metropolitan area, large numbers of people are getting exposed to foreign goods and trends. As the country further develops and its economy continues to grow, so will the consumer market. Tastes may change, but for now if you are a company looking to sell in Korea, have one clear brand and don’t get too crazy with your marketing or your style. Apple has had a long standing reputation for creating eye catching, and music oriented ads that showcase their products. At some point or another, everyone has definitely noticed an iphone ad for some reason. In this case, I was caught slightly off guard, as I noticed the music the movement and imagery, but wasn’t immediately aware of it being an apple ad. For a moment I thought “wow, someone else has made an ad that rivals iphone” but of course, then I realized what I was watching was in fact an iphone ad. The music, movement and imagery give the audience as sense of sexiness, of desire and intrigue. And, it works for the iphone. Well done. As always. This is just funny- pure and simple. Fruit of the Loom has made itself relevant to the current culture of selfies and Instagram by calling out the shirtless selfie- and it’s brilliant. This ad is both engaging, and sarcastic which, I admit, is a perfect combo for me to like something. It even encourages the viewer to use the hashtag, and suggests that they themselves are doing so as well- thus increasing their Instagram engagement through real actions. Simply brilliant. Another funny one that may be old but still sticks in my mind as one of the most memorable ads. This video prompted 12,000 orders in a two-day span after it's release in 2012, and has generated over 25 million views as of June 2018. Pretty impressive if you ask me. Love this series of commercials by rocket mortgage. Really entertaining. The only thing is...when I went search for them on YouTube I first searched "quicken loan commercial"--uh oh!! I think they're going to need to do something to reinforce the name "rocket mortgage"
I was actually touched by the recent Facebook ad: it rings true and is certainly why I started using it (and continue to) in my non-obsessed-once-or-twice-week way. Love the change of pacing it uses too. And the choice of narrators voice: he is "a good guy". I love it when a really good commercial does not need to have a really big budget. Picture a bottle of Heinz Ketchup against a white background. The bottle begins to tip into a pouring position. Cue two of the most recognizable musical notes ever. Etta James singing, “At llaaaasssttt….” Except that this time, the second note holds on an impossibly long time, “At lllaaaaaaaaaaaaaaaaaaaaaaaaasssstttt….” because Heinz Ketchup is SO rich & thick, it takes that long to come out of the bottle. Simple. Effective. Nice! It occurs to me that a cluttered basement can have the same impact on a viewer as cluttered advertising. There may be really cool stuff in the basement or really cool information in the ad, but if every possible nugget of information is crammed into the ad, the viewer will tip-toe away like the aforementioned basement-retreat. When you stuff too much into an add, it becomes visually and informationally congested and hard to take in. Your viewer is likely to glaze over and move on to something that is more succinct in look and content. The goal for most advertising should not be to educate the viewer on everything there is to know about a business/product/service, but rather, to compel them to take that next critical step: pick up the phone, look up the website, read a review. That is accomplished by making the advertisement clear and compelling enough to cause enough intrigue to explore further. Less is always more when it comes to advertising. Inspire your viewer to explore further. Not do the backward shuffle away from an over-cluttered advertisement. Everybody knows the customer is #1 on the Make Happy List. One way, especially early on, to provide quality customer service is by establishing unique relationships with individual customers. For example, a handwritten letter simply stating “YOU ROCK, JANET” will instantly turn Janet into a returning customer. Maybe Bobby got an “exclusive” deal for being such a valued customer. There’s a difference between saying, “I love everyone” and “I love you, specifically”. Look, we’re all selfish. Trust your gut every time. It is an invaluable decision-making tool. And as an added bonus, you’ll never have to worry about hindsight! “Welp, I’ll know what to do next time,” is better than “Damn, I knew that wasn’t gonna work”. To quote Brad Pitt’s character from Seven, “What’s in the box?” The answer is; everything that has been done before. When it comes to marketing, I’d argue that there is more to offer by strategizing outside of conventional thinking. In these current times, there really is no right or wrong way to success. That’s why I suggest trying the unconventional. Make a product placement deal with a Netflix show. Autograph every 25th product just because. Start an ad campaign that chronicles the adventures of a puppy and a piglet. Use the box for deposit rather than withdrawal. It’s 2018. If you don’t have a Facebook, Twitter, Instagram, Linkedin and Tumblr, for good measure, then your business is probably more of a secret. Having an internet presence is basically the standard for any company, person, or thing. Understandably, social media can be an overwhelming task. If you find yourself struggling with social media, seek help from millennials! Hire college kids to be your interns (paid handsomely in college credit). Make sure they know how to make memes. This one rhymes so it’s definitely true. A good employee is hard to come by. Conversely, a bad employee is a dime a dozen. It is important to notice the difference as soon as possible. A lot of managers go easy on the slackers and overwork the good employees because their work ethic has set different expectations. Reward good behavior. Remember poor behavior. A bad apple makes a bad pie. We’ve talked previously about our relationship with failure. Failure can cripple our momentum in a moment’s notice. The fear of it alone prevents startups. Now, while atychiphobia (that’s actually what it’s called) isn’t necessarily always a bad thing, dreading a loss is the wrong way of approaching it. The truth is, you need to fail. You can’t spell FAILURE without FUEL. Catapults require setbacks. Pull back and reflect. Use the knowledge you gained to adjust your trajectory. Then, launch back in there! What does a successful business and a human ear have in common? They both listen and grow perpetually. Wow, I really can’t stress how critical this is. There is always more to learn. There is always room to grow. Obviously. Don’t forget, your number one confidant and competitor, above all, is YOU. So do yourself a favor: pay attention to your environment and innovate constantly. Run your business like it’s your business. Ahh, the era of smart phones, and what's a phone without its apps? Facebook: "Because I need to see how our business pages are going, plus check in with my personal friends and family"
News: "Despite the fact that much of it is depressing, I do read the news fairly regularly"
Fitbit: "Trying to trick myself into believing I’m going to be more active – I’ll start this spring!" Spotify: "Tunes and podcasts- I probably use this one the most"
Credit Karma: "I’m crazy about checking my credit and monitoring my payment history"
Snapchat: "Yes, I am a millennial. Yes, I like taking selfies. Yes, I use Snapchat." Gmail: "My inbox is my life. I am constantly checking my email throughout the day"
Apple Music/Pandora: "My long commute calls for car jam sessions. I love music and these two apps are everything"
Youtube: "Feeding into my HGTV obsession, I love sitting down and spending hours watching DIY videos that I know I won't ever actually do (hey, I can always dream)"
MoviePass: "Every movie lovers dream. Trust me, you need the MoviePass in your life"
Group Me: "This is an awesome app that my widely-spread-out large family uses to keep in touch on a daily basis. It’s basically glorified text messaging, but all in one place with a clean conversation thread that’s easy to follow, with photos, videos, links and whatever else you want to add. Much cleaner and less annoying than a ton of texts loading up your phone that you lose track of. And it keeps the entire thread FOREVER so you can go back and find things." Bitmoji: "Ok it seems silly but I actually do use it! The secret is to create a fun avatar of yourself (you usually find yourself laughing pretty hard when you’re creating it); then pick surprising ones to send out—i.e. not your typical ones. There are hundreds of Bitmoji messages for every conceivable greeting, occasion, situation, emotion, time of day etc etc. If you’re clever, its not a “groooaan” to the recipient." Parkwhiz: "Find parking in the city close to your destination well before you drive down and pay for it in advance…usually a little cheaper than normal." Dictionary: "I love words. What else can I say? Like…do you know what a schwa is?? Get the Dictionary app and find out!" FaceTime: "To talk to my mom"
Instagram: "Honestly, to waste my time"
Youtube: "To watch Persian movies and random stuff"
Soundcloud/RadioJavan: "To listen to Persian music and podcasts"
Waze & GoogleMaps: "To find my destination. I'd literally be lost without them"
Duolingo: "Ahora, mi español es mas major que antes. Y el pequeño búho esta lindo." Realtor.com: "Window shopping for a new house for our family. I like Realtor.com the best because it posts the most photos and is easy to navigate and customize your search." CreditKarma: "So that window shopping can turn into actual shopping for a house! Check your credit as often as you like. For free and without dinging your score." Very simple guy with a very simple phone.